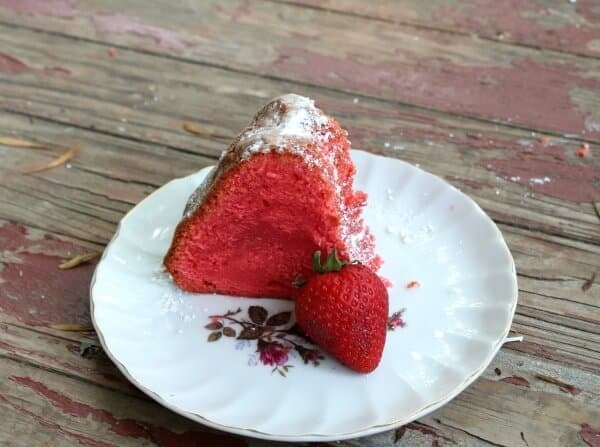 This tangy, moist strawberry cream cheese pound cake recipe is dense and delicious with a velvety texture. It is firm enough to use in stacked cakes like wedding cakes but easy enough to make anytime. A secret ingredient gives it its unique flavor and vibrant color. My eldest daughter’s best friend got married a earlier this month and she had asked me to make the cake. I don’t make wedding cakes often and usually just for family and close friends. They are time intensive and I charge a crazy high amount for other people. Anyway, after discussing various flavor combos she decided on strawberry with ganache filling. I was cool with that. I was cool with that until I realized that there is no strawberry pound cake recipe that I know of that would stand up to the rigors of wedding cake — being stacked, being transported and hour and a half, etc. I thought about it for days and just before I was about to tell her we had to go with a vanilla cream cheese poundcake I got an idea. Why not try strawberry Kool Aid? It just doesn’t get better than that. The cake held up perfectly and tasted delicious. So, this cake has nary a fresh strawberry in it but the flavor and texture are unbeatable. This has opened up an entire world of possibilities to me, which no-doubt you’ll be seeing on the blog in the weeks to come. Be careful not to over mix the batter or you’ll run the risk of the cake being tough. This is baked in a slow oven for a long time but the resulting cake will knock your socks off. The following is an affiliate link. If you click and buy something I’ll get a small commission which is used to maintain the blog. Thanks for being a part of Restless Chipotle! A heavy bundt pan makes all the difference in cakes like this. It keeps the outside from browning to badly and helps it cook evenly. This classic Nordic Ware pan is awesome and it comes in a couple of different designs… Best of all, it will last forever! 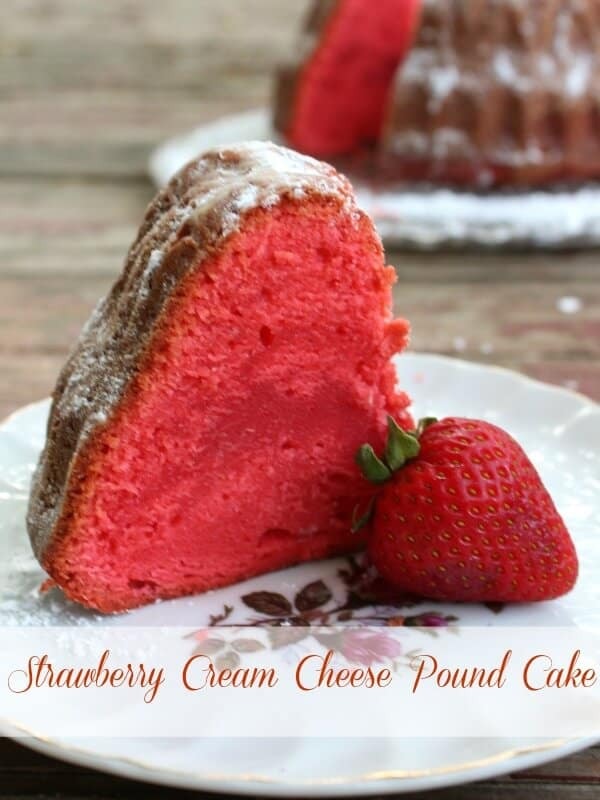 A vibrantly pink cream cheese pound cake that tastes like tangy strawberry. It is dense, moist, and velvety and can be used for wedding cakes or bundt cakes or even cupcakes! 2 packets strawberry Kool Aid, the kind you add sugar to. Grease a bundt pan thoroughly and then dust with flour. Beat the cream cheese and butter on the lowest speed of the mixer until well blended. Add the sugar and continue to beat until blended. Add the eggs, one at a time, mixing each in thoroughly before adding the next one. Add the Kool Aid mix, vanilla, and the sour cream and blend. Mix just until blended and smooth. Spoon into bundt pan and smooth top. Bake for 1 hour and 40 minutes, or until a cake tester inserted in halfway between the edge and the center comes out clean. Remove from pan and drizzle with a glaze or let cool and dust with confectioner's sugar. Which flour do you use? All purpose or self-rising? Could I use cakeflour instead of all purpose flour? The cake looks delicious by the way. I’d be afraid it wouldn’t rise well. I’ve been asked to make a 2-layer strawberry birthday cake that will hold a heavy topper. This recipe sounds perfect! Could you help with the following questions? 1. Does this recipe yield enough batter to make two 9″ round cakes? 2. What temperature and baking time should be used? Thank you so much for the recipe and for answering my questions! 1. I believe it does- although I haven’t measured. I think a bundt pan is equal to 2 layers. 2. I’d say 375F for 25 to 30 minutes. Thanks for your quick response, Marye. The batter filled two 9″ round pans and the assembled cake was the height of a typical two-layer cake. I baked the cakes at 350 for 33 minutes (I was waiting to see if the cake edges would pull away from the sides – which they never did). In retrospect, I think 30 minutes would have been about right. Due to the density, the cake was easy to frost and decorate. Looking forward to tasting the cake! I am so glad! Thanks for letting me know. Getting ready to make this right now for a friend’s birthday. But…I noticed you didn’t list baking powder/soda? Is that correct? Thank you! 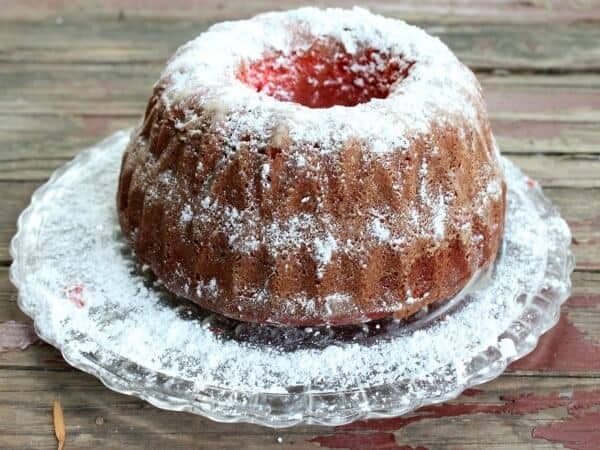 Rather than dusting the pan with flour, could you dust with an extra packet of strawberry koolaid so the cake wouldn’t have the white flour on the outside when removed from the pan? It would make it too tangy for my tastes but I imagine you could? I’ve never had the problem of the flour sticking. Just don’t use much. Can this recipe be increased to make a 12 in layer cake? Probably – you can increase the serving sizes on the recipe card and that should help. I used this recipe in my bakery for a wedding cake and it was a hit. It is so delicious . Thank you for posting this. I have one in my oven right now to decorate for a wedding shower. Hi This recipe is awesome!!! The texture was so nice and the flavor. I would love to make just plain vanilla cupcakes without the red Kool-aid. Would that mess with the recipe? Trying this out for the first time and I’m going to top with fresh strawberries and a cream cheese glaze. Wish me luck!!! Hi! I DEFINITELY WILL BE trying this this weekend. I’ve been on a pound cake frenzy. I’m excited to make it! Your cake looks delicious!! Could fresh or frozen strawberries be substituted for the koolaid? Thank you, Kessa. No, actual fruit would throw off the proportions of the recipe. The color of this is insane! Such a pretty surprise to cut into! This may be a silly question but, if I change out the koolaid flavors would it still bake about the same? I’ve got a party coming up and would love to have strawberry and a lemonade version of the same cake and then serve them side by side. I’ve never tried so I’m not sure. Hello, I want to make this, but I’m curious to know…why the sour cream? My husband and I just made this. It is delicious! We are taking it to my parents tomorrow. I bet no one will guess it’s koolaid and not fresh strawberries. Thank you! I am glad you liked it. How did your parents like it? I noticed that it says you can make cupcakes with this recipe. Would love to try, could you tell me about how long I should cook them and at what temperature? Thanks! My God child wants a birthday cake with one layer strawberry and the other blueberry! Strawberry frosting. Going to look for blueberry kool aid and half the flavoring in each. How long will it take to bake? About an hour and forty minutes per cake including prep time. Oh mercy this looks like just the ticket for spring! I love the color of this cake! I bet it is delicious!! This must have been a fun one to make around Valentine’s Day! It really is vibrant, isn’t it? 🙂 thank you! It is so good. Not only does this look amazing, but seriously – the colour of the cake! BEAUTIFUL! I like that it’s not an overly sweet chocolate cake, and this would go beautifully with a cup of tea or coffee as a sweet treat!